In 2007 I’d been in a dead-end job for 5 years. I kept applying for other work, but was rejected repeatedly. My mental health was declining and the promise of my 20s was fading away. I’d never been keen on the idea of volunteering. I’d thought that I should probably make some money before I started giving my time away for free. A friend of mine was a volunteer at Westminster Youth Offending Team (YOT). They pressured me into going. At around the same time, a regular customer where I worked had been talking about restorative justice. The YOT showed me a video about a man who had escaped a life of violent crime by being confronted with the effects of his actions. I was convinced that restorative justice made a difference and signed up to volunteer. My first role at Westminster YOT was that of a community panel member. I represented the local community in meetings between young people who had pleaded guilty to crimes in court and been given a referral order. For 2 months, I attended training every weekend. We covered topics such as tackling prejudice, active listening and understanding how the youth justice system worked. My role was to ensure that young offenders took responsibility for their crimes. I worked with them to agree how and for how long they should recompense society or their victims. Sometimes I participated in mediating between the two parties. All of this resonated with me. I’m lucky to have grown up in an environment which was relatively privileged. I didn’t face the barriers and problems other people my age did. I had opportunity and support. I know that my life could’ve turned out very differently and I felt I owed these young people something. Volunteering got me free skills and a job! As soon as I updated my CV, I had a job offer from a well-known national children’s charity. I accepted the job and worked there for a year. Then the economy collapsed. My mental health slumped along with it. I couldn’t find work again. I scraped along. Some days my volunteering was the only thing that got me out of bed. Volunteering gave me a reason to get up. I was constantly building skills, including mediation, active listening, working with young people and a host of others. I started mentoring a young person at risk of becoming a young offender and found myself taking responsibility for an 8-year-old boy for two days a month, which was pretty challenging! My career (and I) had several other peaks and troughs, and gradually I stopped working with the YOT. But the skills I gained there were still serving me well in everyday life, and in a variety of jobs. I ended up at GDS, where I worked my way up to become a user researcher. My active listening skills are a premium asset in this role. I still volunteer outside of GDS. In 2015, I started cooking at the Food Chain and hosting people with HIV/AIDS. This keeps me happy as I love cooking and pleases the people I’m cooking for, giving them the chance to eat good healthy food in a friendly environment. I also volunteer in my local community, doing chores for people who have various difficulties. You don’t need to join an organisation to make a difference. There are people that need help near you. 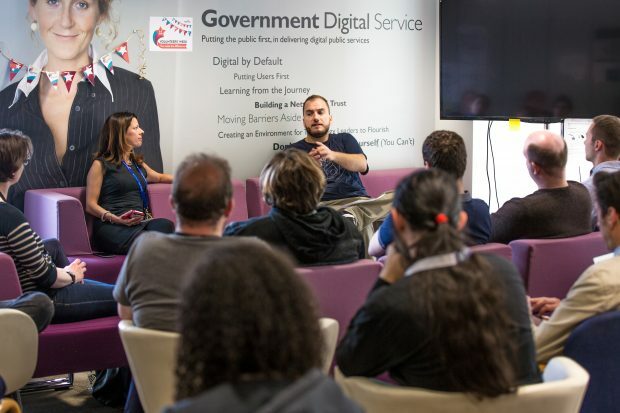 Since becoming gainfully employed by GDS, I’ve done a lot of work with our charity group. Using my contacts with another major charity, Comic Relief, we picked Dragon Hall as GDS’s charity as it is aligned with our own ambitions. I recently delivered a session there, teaching young people design and agile skills for solving problems, which in turn is further enhancing my CV and improving the profile of my employers. One of the good things about working in the Civil Service is that it encourages volunteering. You are given 3 volunteer days every year, with an extra 2 at the discretion of your line manager. That and the fact that if you have the skills, you can get an interesting job in a stimulating environment.